He wore a powder-blue jumpsuit, complete with an oversized belt buckle, as he crooned "Let It Be Me" and "The Wonder of You." TUPELO, Miss. (AP) - In an Elvis Presley contest full of men with slicked-back hair and rhinestone-studded jumpsuits, a 19-year-old was chosen as being most like the King of Rock 'n' Roll. 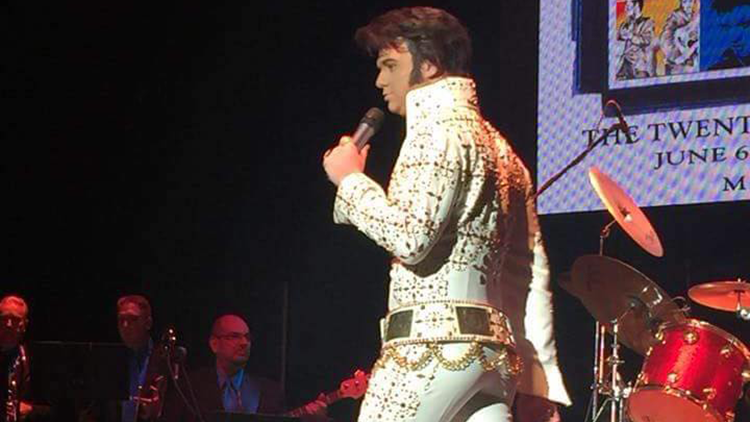 News outlets report that Nick Perkins of Tickfaw, Louisiana, won the Ultimate Elvis Tribute Artist Competition. It happened Saturday in Tupelo, the Mississippi city where Presley was born on Jan. 8, 1935. Perkins was a first-time competitor. He wore a powder-blue jumpsuit, complete with an oversized belt buckle, as he crooned "Let It Be Me" and "The Wonder of You." Perkins will represent Tupelo in August at the Ultimate Elvis Tribute Artist competition at Graceland in Memphis, Tennessee. This was the 20th year for the Tupelo Elvis Festival.